Ready to rent an apartment in Prague? All the apartments in Prague are located in walking distance from the city centre. Prague is a beautiful historical city with a lot of monuments that are described in Prague travel guide. Why to order apartment from Your Apartments Prague? 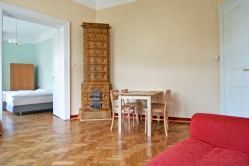 Your Apartments is the leading company in short term apartment rentals in Prague. Our Prague apartments are cheaper than hotels. The apartments are much bigger than Prague hotel rooms. Kitchen in our Prague apartments is always available. Most of Prague aparments are equipped with modern amenities, such as TV, satellite, Internet, kettle and much more. The Apartments are presented with photos, floor plans, detailed description, amenities, prices, availability. We want to make you feel like at home when you arrive to our Prague apartments. Most of apartments we offer are spacious and airy, boasting natural light, while some of the selected apartments have simply stunning views of the rooftops of the city plus the many spires and onion domes that surround the majestic Prague Castle. The apartments are located in the historical center of Prague in neighborhoods rich in galleries, museums, green parks and sights as well as shopping, entertainment, and the best bars and restaurants the city has to offer. 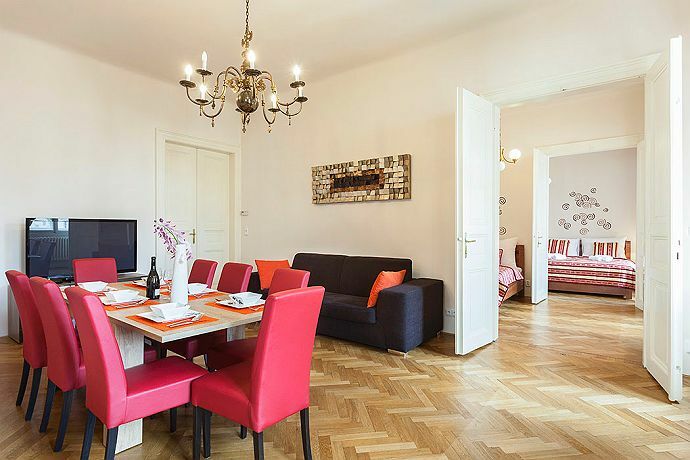 You can find in our offer studio apartments, one bedroom apartments, two bedroom apartments, three bedroom apartments, four bedroom and even five bedroom apartments which is perfect for a Prague holiday with your friends or family. Some bedrooms are especially designed for families travelling with children in which you can get a baby cot. You can click here if you are looking for the Czech translation of Prague apartments. Very nice apartments situated in the historical building on the top floor which is located directly on Wenceslas Square in Prague. Extra high speed Internet connection. Living room + bedroom + kitchenette + bathroom + terrrace. Beautiful view from the terrace to Wenceslas Square and Prague Old Town. It is possible to manage parking for your car on Wenceslas Square (Václavské náměstí). Large apartments situated in the historical building which is located directly on Wenceslas Square (Václavské náměstí) in Prague. Ideal for large groups, there are 3 bedrooms available + living room with kitchenette + bathroom + 2 toilettes. It is possible to manage parking for your car on Wenceslas Square (Václavské náměstí). The apartments are situated in the historical building from 15th century in the location of Lesser Town (Mala Strana) in Prague. There is a high quality rated double bed in bedroom and jacuzzi in the bathroom. Only 200 metres from here is subway station line A - Malostranska and old castle staircase going to Prague Castle in Lesser Town. 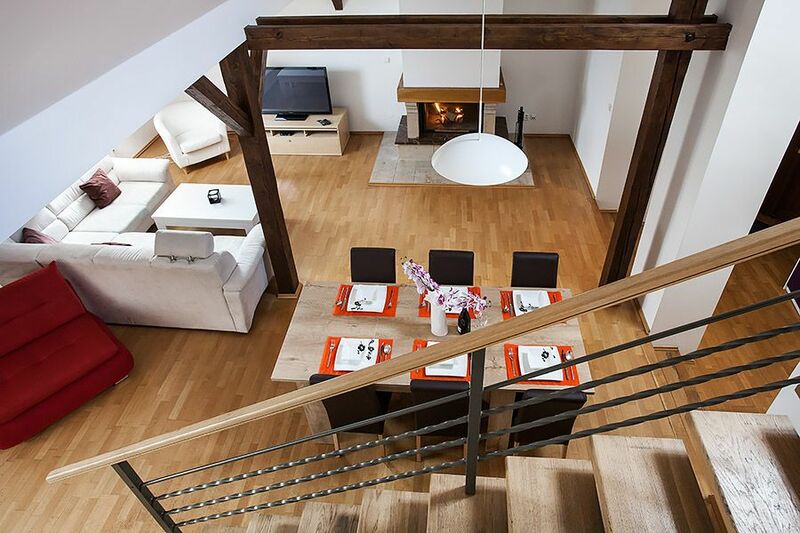 Luxury apartments in the heart of Old Town on Národní street with total capacity of 8 persons for accommodation. 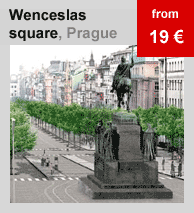 It's located only a few minutes from the embankment, Charles Bridge, Wenceslas Square, Charles Square. The condos consist of 2 bedrooms, 1 living room, kitchenette, bathroom. The apartments are located directly on so called "Royal road" between Old Town Square and Charles Bridge. The apartments are fully-equipped with kitchenette, luxury living room, beautiful bedroom and modern bathroom. If you want to sleep in perfectly equipped apartment during your stay in Prague, this is the right one for you. Are you searching accommodation in the center of old Prague? These apartments offer pleasant accommodation suitable for people fallen in love who came to Prague to spend their romantic vacation. It is situated in perfect location of historical center of Prague 1 – Old Town, only a few metres from Old Town Square and Charles Bridge. The beautiful apartments fully equipped with high-tech appliances and furnished with modern furniture. It is located near to the historical center of Andel, 15 minutes from the historical part of Mala Strana which is so called Lesser Town. The advantage is comfortable parking with the possible garage parking lot. The apartments are situated in newly reconstructed building in very dynamic growing part of Prague - Andel. Thanks to its location and distance from the subway station and tram stop, it has got fantastic connection to the city. There is plenty of famous restaurants, pizza, shopping mall Novy Smichov, multiplex cinemas called Village and Palace.